It is an incredible sight. As our small boat moves towards the Sangam (the confluence of the river Ganga, Yamuna and mythical Saraswati at Prayagraj) much before the break of the dawn, a sea of humanity surges forward to take a holy dip in icy waters in an extremely cold weather by north India’s standards. Thus begins the Shahi Snan (the royal bath), marking the launch of the Kumbh Mela, the grand event of Hinduism. In this crowd, no one is identifiable as every individual’s identity tended merge with the collective whole, the humanity. It is a curious display that combined tradition and modernity, the eternal and the ephemeral. Women take to the river, splashing the water around with gay abandon, without bothering about the presence of Naga sadhus (members of a cult that believes in living naked). Gender equity is very much evident in its most pristine form. At first glance, it may have been a scene from a millennium ago, and yet twenty-first century also hovers over, in the form of three drones through which the police control room kept a watch to ensure safety of the millions who congregated here. This spectacle becomes all the more awesome as a red sun in rises a little north, away from its usual spot, marking its northward journey – Uttarayan. This shift in the celestial configuration is believed to be auspicious for the humanity as it brings longer days and a respite from the cold weather. Mesmerised by the eternal beauty of nature, devotees – rich and poor, young and old, men and women – offer prayers to all gods who, mythology says, descended on earth for the Kumbh – the pot of nectar. Meanwhile, an army of volunteers is deployed all along the ghats to remove waste and garbage after every bathing. The Kumbh predates history and is believed to be an eternal tradition. Yet everything associated with it is ephemeral which is transient and vulnerable. It has an intricate calendar of its own: every two to four years later, a Kumbh Mela or an Ardh Kumbh Mela is held at one of the four sacred spots: Prayagraj (previously known as Allahabad), Haridwar, Nashik and Ujjain. From time immemorial, devotes from across the country have driven to this place where a drop of amrit (nectar) fell after Samudra Manthan (the churning of the ocean). 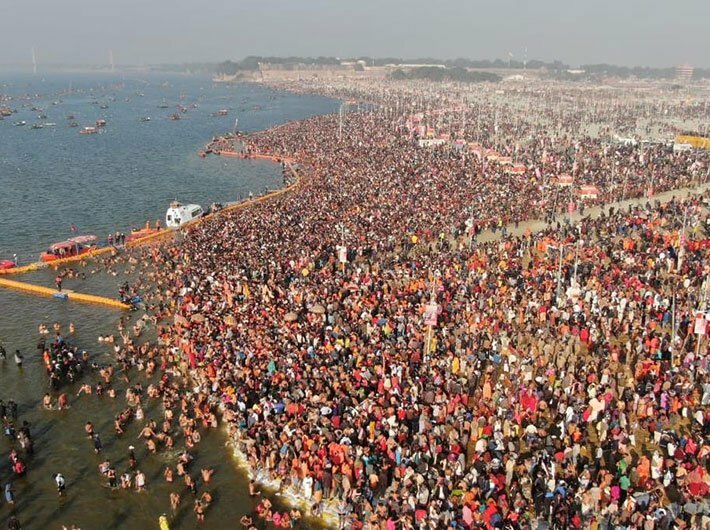 Driven by the religious impulse to partake of that amrit and become immortal, millions throng in hordes at the sangam that looks like an incessant stream of a veritable human sea. But behind the backdrop of this mythical immortality lies the transient nature of the physical infrastructure that gets erected within three months. As the Mela gets over, this infrastructure that literally accommodates equivalent of Australia’s population vanishes in thin air. Within six months every trace of that infrastructure will be gone from the banks of the Ganga and the Yamuna. The Uttar Pradesh government has made massive investments to facilitate this most sacred of Hindu pilgrimages. An area of 3,200 hectares along the banks of Yamuna and Ganga has been taken over, divided in nearly a score of administrative zones where officials are on duty to ensure all arrangements. A parallel township has been created with 1,500 ‘premium’ tents and night shelters, and 1,22,500 toilets. An effective sewerage system has been laid out in the entire township and its flow is taken to a nearby sewage treatment plant (STP) to prevent any dirty discharge in the river. The government has also capped some drainages that have been discharging toxic effluents in the rivers. The place where devotees take the holy dip at the sangam has been effectively fenced and its water level is maintained at four feet or below. Its fence is bookended by nets in order to fish out anyone who might happen to drift towards depths. In essence, the government has pulled all its sinews to ensure a seamless celebration of the Kumbh which hosts the biggest gathering of humans on the earth. Given the complexities involved in it, the Kumbh is no doubt the toughest administrative challenge. In the morning, the Mela began with the bathing by Naga Sadhus of Mahanirvani Akhara. With ashes pasted on their bodies, these naked sanyasis belong to a spiritual sect that follows the rigorous path of mortification of the body to lift the spirit. Its practices prima facie appear to be quaint but are symbolic of cosmopolitanism of Hinduism that gives a wide latitude to people’s behaviour in their spiritual pursuit. For nearly an hour this akhara occupied an assigned area of the sangam where administration remained quite alert to keep the situation under control. Given a mercurial temperament of the adherents of the Naga sect, a slight provocation often causes serious trouble. But the Akhara members left the place quite contented. Then came followers of the Atal Akhara. Interestingly, the other devotees of the Akhara also joined Nagas in performing ablutions in the sacred place. That the Kumbh Mela is the greatest leveller becomes apparent if one looks at the scale of the human participation and heightened spirituality. There is a possibility that a privileged few may have found a better access through official contacts, they do not seem as contented as those who have travelled thousands of miles and walked on foot and took a holy dip to satiate their spiritual quest. It goes to the credit of the herculean efforts by the administration that these ordinary devotees find their trekking to the sacred spot at the confluence better managed than in the past. The Prayagraj Ardh Kumbh Mela of 2019 will be on till March 4. More and more devotees will arrive here, looking forward to cleanse their sins with a Kumbh dip. Apart from the holy bath, they will have an opportunity to do a darshan of grand Ganga aarti, watch Ram Lila or a ‘laser show’ on the history of the Kumbh. There is an amusement park, planned sangam walks and heritage walks, virtual reality kiosks and, yes, a selfie point. Soaking in the Kumbh, they will have come face-to-face with a veritable microcosm of real India where faith and religiosity is hardly confined to a straitjacketed notion.